Penniless graduate Blair Wilkes has always felt one step behind everyone else in her life. Unemployed and out of luck, with the uncanny ability to cause havoc wherever she treads, when she receives a job offer from a strange town called Fairy Falls, she's certain it's too good to be true. It turns out Fairy Falls isn't just eccentric: it's magical. And so is Blair. 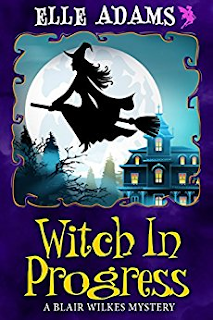 Learning she's a witch with a never-before-seen talent is just the first in a series of surprises that await Blair, but her new life comes with its fair share of pitfalls. From a hot ex-paranormal hunter security guard to a co-worker with an inexplicable grudge against Fairy Falls's newest witch, not to mention the mysterious death of a former client, Blair swiftly finds herself overwhelmed. After her magical skill gives her an unexpected lead on the murderer, she finds herself dragged into the investigation. Can Blair figure out her magical talents before the paranormal killer notices she's on his tail? Or will her new beginning come to an untimely end?